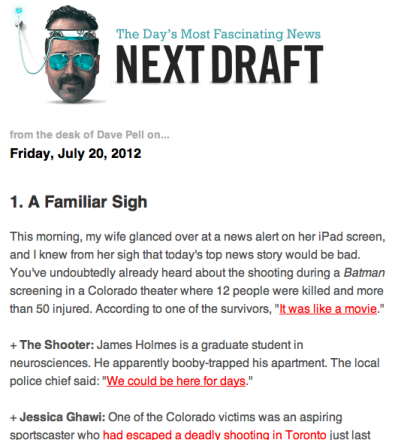 Following on my post about Evening Edition, I wanted to drop a quick note here about Dave Pell’s excellent Next Draft, a daily mid-day email newsletter that does a fine job of assembling a few-minutes’ worth of reading and links about what’s happening today online. It’s really not that much different from a good linkblog, except that a) it’s not a blog — it’s an email and b) like Evening Edition, it’s published just once a day. Not long ago, I did a major, weeks-long purge of my inbox, removing tons of opt-in and not-so-opt-in newsletters, so Next Draft has a pretty good chance of being a welcome “Ding!” in my email reader. What’s your experience? Is the “just-enough” approach of Evening Edition and Next Draft a welcome change? For me, so far, it is.